It was just a little over 20 years ago that I read The Great Ape Project (St. Martin’s Press 1993.) In that book, Jane Goodall and thirty or so others argue that chimpanzees and the other great apes have a right to life, liberty, and to be protected from torture because they are enough like humans in morally significant ways. These three rights were enumerated in “A Declaration on Great Apes.” My wife and I were so moved by their arguments that we sent a copy of the book to all the members of the U.S. Senate. In many ways, Chimpanzee Rights is an extension of some of those arguments and a worthwhile companion piece. Chimpanzee Rights: The Philosophers' Brief is an extended amicus curiae brief written by thirteen philosophers in support of the Nonhuman Rights Project’s continuing legal efforts to have a court recognize specific animals as legal persons under the law and through the use of habeas corpus, to have them released from extreme prison-like confinement and sent to a sanctuary dedicated to providing ex-captive chimpanzees the opportunity to fuller lives. To-date, no judge has issued a writ to free any of the Nonhuman Rights Project’s clients. 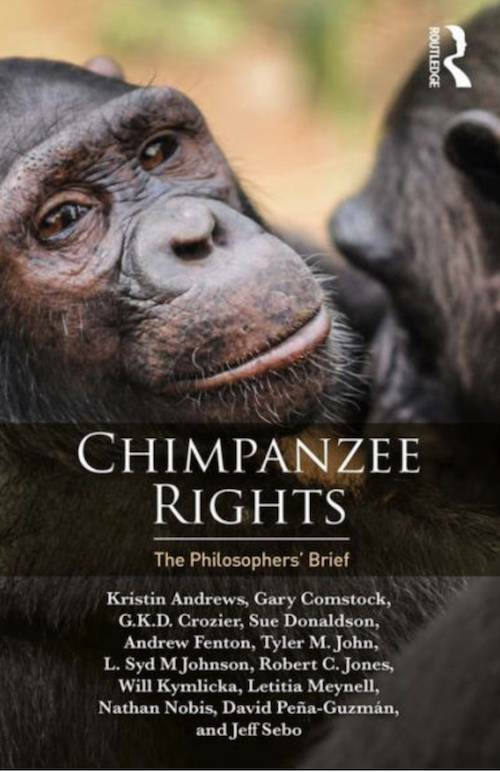 Chimpanzee Rights argues that the judges decisions were illogical, misinformed, or based on frank errors in the authoritative works they cite in their decisions that chimpanzees are not, and cannot be persons under the law. Future courts have a high hurdle in front of them; the authors of Chimpanzee Rights make a very strong case that existing language in the law and in the works on which much of the pertinent legal theories are based are unambiguous about the characteristics needed in order to be considered a legal person, when read without bias or prejudgment. The authors make a particularly strong argument when addressing what is referred to as the social contract. The inability of animals to fulfill responsibilities implied in the idea of a social contract is argued by many supporters of the status quo to bar their legal recognition as persons. The authors clarify this logical mistake by pointing out that the social contract is created by persons, not the other way around. Chimpanzee Rights provides a closely argued and very strong argument for the courts to recognize the legal personhood of chimpanzees. Critics fear that doing so will open the flood gates, which it will, but that hardly seems reason enough to deny billions of the earth’s other inhabitants their fundamental rights. Persons interested in this topic, and in the broader question of our claim to rights in general will find much of interest and value in this timely amicus curiae brief. Kristin Andrews, York Research Chair in Animal Minds, Associate Professor of Philosophy, York University, Canada. Gary Comstock, Professor of Philosophy, North Carolina State University, USA. G.K.D. Crozier, Canada Research Chair in Environment, Culture and Values, Professor of Philosophy, Laurentian University, Canada. Sue Donaldson, Research Associate, Department of Philosophy, Queen’s University, Canada. Andrew Fenton, Assistant Professor of Philosophy, Dalhousie University, Canada. Tyler M. John, Ph.D. Student in Philosophy, Rutgers University, USA. L. Syd M Johnson, Associate Professor of Philosophy and Bioethics, Michigan Technological University, USA. Robert C. Jones, Associate Professor of Philosophy, California State University, Chico, USA. Will Kymlicka, Canada Research Chair in Political Philosophy, Queen’s University, Canada. Letitia Meynell, Associate Professor of Philosophy, Dalhousie University, Canada. Nathan Nobis, Associate Professor of Philosophy, Morehouse College, USA. David Peña-Guzmán, Assistant Professor of Humanities and Liberal Studies, California State University, San Francisco, USA. Jeffrey Sebo, Clinical Assistant Professor of Environmental Studies, Affiliated Professor of Bioethics, Medical Ethics, and Philosophy, and Director of the Animal Studies M.A. Program, New York University, USA. Foreword: Lori Gruen is William Griffin Professor of Philosophy at Wesleyan University, USA, coordinator of the Wesleyan Animal Studies program, and Professor of Feminist, Gender and Sexuality Studies and Science in Society.